Duke Ellington once said, “It Don’t Mean a Thing If It Ain’t Got That Swing”. That “statement” once ruled the golden swingin’ era, but now the former Stray Cat Brian Setzer, brought it alive again to the present day. The rockabilly guitar-singer, big band impresario and all-around cool cat Brian Setzer is going to release his brand new album, “Songs From Lonely Avenue”, a film noir-inspired album that will hit the stores soon on October 13th on Surfdog Records. 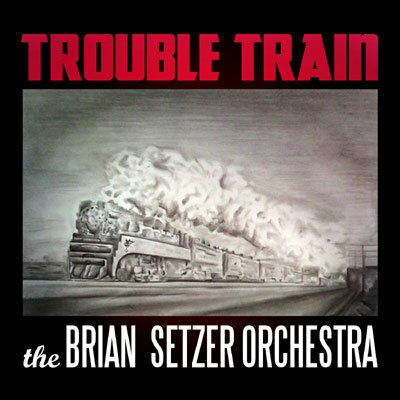 If you think of the glorious ol’ day of swingin’ big band, and put the old fashioned Rock and Roll in your perspective, you’ll get Brian Setzer. Nobody brings you these two magical music together better than him. He’s the master of it. It’s the world where rockabilly and swing cross path with magic sprinkling all over. He was one of the most influential person, or we may call a pioneer of the swing revival, or some people called it as retro swing/neo swing, which has delightful blend of blues, rock, rockabilly, even ska into swing. Following the hugely successful collection of christmas carols in “Christmas Rocks” which will be re-released once again to support Brian Setzer and his stunning 18-piece big band on their seventh Christmas Extravaganza 27-date tour starting November 20th in Detroit, the “New King of Jingle Bell Rock” Brian Setzer and his orchestra, the Brian Setzer Orchestra are ready to launch “Songs From Lonely Avenue” contains 13 songs, comprising 10 vocal tracks and three instrumentals in the tradition only Setzer can bring. Setzer repeats his approach on his 2007’s “Wolfgang’s Big Night Out” by recruiting 87-year-old Frank Comstock who wrote music for many era’s legendary artists, including Doris Day, Sonny Dunham, Benny Carter and Judy Garland, not to mention the classic “Rocky & Bullwinkle” theme. Frank Comstock is one of the most important and inventive arrangers of instrumental music of the last century, to score the horn arrangements. His touch shapes up this album to a new level. Happy to say that two singles are released from the album. The devilish “Trouble Train” appears in propulsive rhythm, an ominous minor key and wickedly good roaring guitar, this song revisit the familiar character of the devil up to his old tricks. Speaking about train, I’ve been waiting to see another composition to meet the ageless legend “Take The A Train”, and this one is a match. Not only that, but this song also echoes the other great song about Lucifer, the Charlie Daniels‘ masterpiece “Devil Went Down to Georgia”. “Trouble Train” is simply a massive opening to set the mood for the whole album. Another single is the sentimental classic swing style “Lonely Avenue”. This is a delightful track that is going to take your breath away. Looking at the result so far, this single is doing really well as it currently stays on top 5 on iTunes’ Jazz Chart. 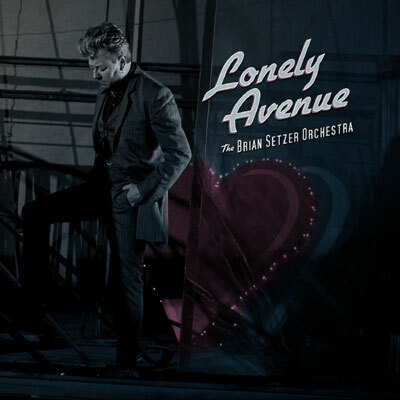 “Songs From Lonely Avenue” also marks the first time Setzer has written every tracks on the album. It’s noir, with all the scope of a Raymond Chandler novel or an Orson Welles film, this beomes his most ambitious project to date. Don’t miss to have these two new singles of Setzer. Throughout the rest of the album, thugs prowl the street, young couples dance the night away in New York, hearts are broken, and lives are taken. It’s the scene from the Lonely Avenue, and you are going to have the chance to feel them all through Setzer’s upcoming new album.